with a Tifosi IROC Challege. anyone who comes is going to have some fun. So Dave, what happened? When my name is used to promote something, I expect some action to see things through, or at least a real good excuse as to why it didn't take place. I agreed to have the race and that was the last I heard. The season is pretty much over. I agree. IROC is the perfect format to exhibit a new format so everyone can give it a try without having to make a firm commitment. 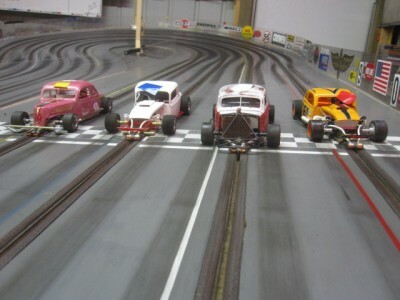 But it is also lots of trouble, time, and expense to build four cars to see if racers are interested. I'm glad I didn't build four Hot Rods, three guys built four cars ( I built two ) and nobody was interested. In fact they were laughed at by a few despite the fact we installed sealed super sixteens. They ran great and handled good and did not touch wheels and fly all over the area as a few had predicted. For us who raced them, it was a lot fun. But if you don't have a following, the class is over. The four cars are still in existence......mmmm. mmmmmmmmmmmm..................Flash forward to 2013!! After Dave went into hiding, this Hot Rod class was re-named Early Modified. For us who race them, they are fun. Open wheels are not the monster that some say they are, they handle well and are as fast or a tad faster then the Econo/Sportsman as their chassis are the same design.